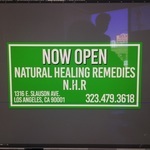 NHR (Natural Healing Remedies) delivers an unsurpassed level of care, attention and services to the whole community of Los Angeles, CA. From the very establishment our company was always a compassionate and caring organization working towards improving the quality of life in our city. Not only do we provide prime-quality medicinal products here, but we also have created a safe space for our patients to gather and discuss medical conditions freely. Knowing first-hand the positive effects that medical marijuana can bring to patients suffering from chronic pains, sleep disorder and even cancer, we at NHR decided to create a selection of products that can address various health needs. You may find here the assortment of over 50 different grades of Sativa, Indica and Hybrid, all of which were tested for safety and potency.